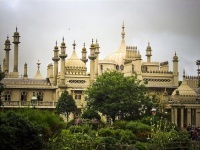 Brighton is blessed with a proliferation of ornate Regency architecture, and buildings like the Royal Pavilion are must-see tourist attractions, but in truth visitors generally come for the shopping, nightlife and beaches more than they do for sightseeing. 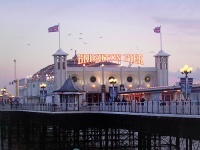 The Brighton Palace Pier is packed with holiday attractions like a funfair, fast food stalls and a game arcade, and the beachfront is central to touristic stays in Brighton. Mention shopping in Brighton and the first thing that springs to mind is 'The Lanes!'. And for good reason - the Lanes have been operational in Brighton since the 17th century and today host an assortment of boutiques, antique shops, jewellers and book stores, as well as a few cafés and pubs. Here visitors can find anything from kites, tribal textiles and hand-made crafts to vintage shoes or funky fashion accessories. If the weather is bad, head for one of the delightful retro pubs and tea rooms that are strewn around Brighton. Those wanting a slight change of scene should head to neighbouring Kemp Town, a charming village with the same Regency appeal of Brighton and plenty of lovely shopping opportunities. The nightlife in Brighton and Hove is exceptional. This exciting seaside escape, only an hour from London, is a vibrant social hub year-round. With plenty of great restaurants, cafés, bars and clubs, the party just keeps on rolling; many of Brighton's chief attractions only come to life after dark. 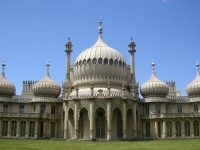 We are looking for contributors for our Brighton travel guide. If you are a local, a regular traveller to Brighton or a travel professional with time to contribute and answer occasional forum questions, please contact us.